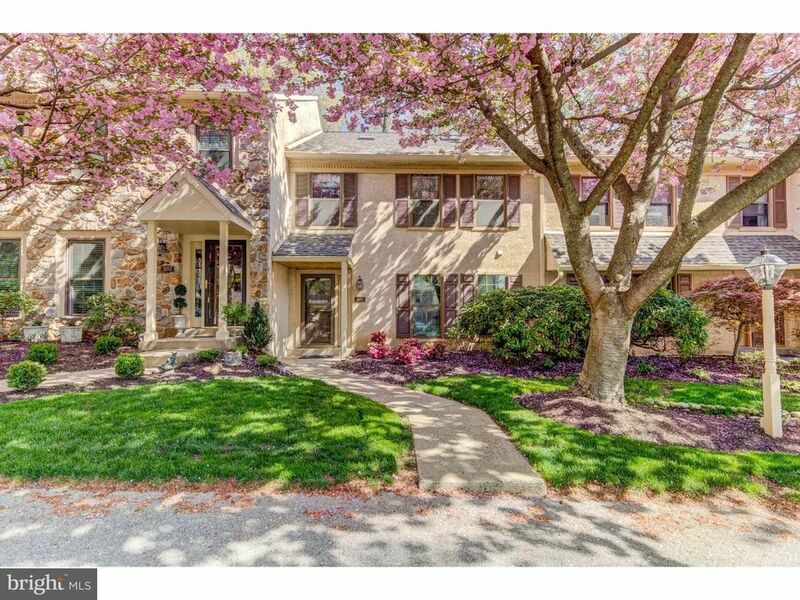 Low-maintenance Main Line living can be yours in this spacious 3-4 BD, 2/1 BA townhouse in sought-after Weatherstone. Located in a quiet area of the community which backs to a greenbelt of tranquil open space, this home has neutral white walls, wood flooring throughout the first floor, and neutral wall-to-wall carpeting upstairs. The cozy Den has a fireplace which is flanked by built-ins. The adjacent eat-in Kitchen has neutral white cabinets and appliances. The open-concept Living and Dining Room area can easily accommodate large gatherings. You'll love dining 'al fresco' on the rear patio, which is enclosed by fencing for privacy. Upstairs, the Master Bedroom has an en suite BA with double vanity and huge walk-in closet. Two more hall Bedrooms (one with two closets) share the 2nd floor Hall Bathroom. The washer/dryer are also conveniently located on this level. The 3rd floor Bonus Room has 2 new skylights, a closet, and is ideal for use as a 4th Bedroom, Office, or Studio. Ample room for storage and potential for additional living space is available in the full, unfinished basement. Newer systems include a new roof and skylights in 2017, new furnace in 2017, and new A/C in 2015. Highly regarded Great Valley school district. Weatherstone Homeowners Association sponsors social activities which foster a strong sense of community. The neighborhood grounds are meticulously maintained and this home is just a short stroll from the sparkling community pool and recently renovated clubhouse. HOA dues include the pool, clubhouse, lawn care, trash, and snow removal. Convenient location near the Paoli Train Station (with express service to Phila. & NYC), Center City, Wegmans, King of Prussia, corporate centers, and the Airport. No need for snow shovels and yard tools - come enjoy relaxing poolside this summer!